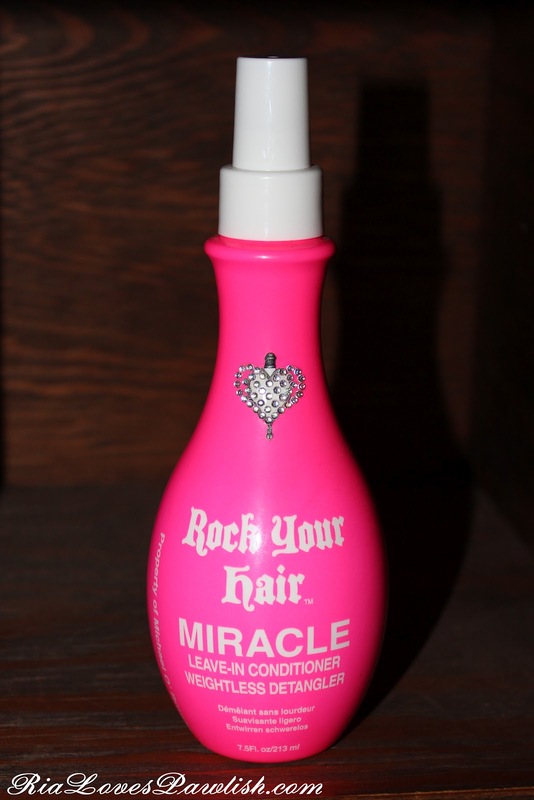 today's we're checking out Rock Your Hair Miracle Leave-In Conditioner and Weightless Detangler. i'm happy to report that this product does both those things well! i use Miracle on my hair while it's still wet after being washed, spraying it all over and then using a brush to go through my hair and make sure everything is evenly distributed. i definitely think it helps keep my hair moisturized and healthy. i also use Miracle as a detangler... when i use hairspray i tend to use a LOT in conjunction with teasing, so my hair is sticky and knotted at nighttime. i spray Miracle all over before i even try starting to brush out the knots, it really helps the tangles release and hairspray seems to be less bonded to the hair (but that could just be a side effect of the hairspray getting wet!). if you have fine hair like i do, be careful not to overuse, it will cause your hair to become greasy! i really like the spray nozzle on the packaging, it causes the product to come as an extremely fine mist... as opposed to some that spray out big drops that concentrate on one spot of your hair. the smell is strange... to me, it smells exactly like the breath mint Sen-Sen... which most people probably won't even have heard of! it's a very old fashioned type of candy... it kind of smells like licorice and roses... it's quite hard to describe. i would say it's a smell that probably will not appeal to everyone, so definitely take the cap off and smell it before committing to purchasing! the packaging of the entire Rock Your Hair line is adorable... so girly and fun. all the bottles are bright pink with white caps and little rhinestone hearts on the front! check out their Facebook... https://www.facebook.com/ROCKYOURHAIR. I just saw this company's entire collection at TJ Maxx for over 50% off! I only use organic products in my hair, but the bottles for this collection are so girly and cute! whoa! i saw a few things at Marshall's, but the one thing i really wanted to try had been opened and yuckified :( their packaging is the best! Ok so now I need to get this and the tangle teezer! I am going to the big city (ok not really big but a lot bigger than my town that just has walmart lol) next week so will be looking for these 2 things!